Officials with Hacienda HealthCare said its board of directors determined it's not sustainable to keep operating its intermediate care facility in Phoenix. Rep. David Cook, R-Globe, was reportedly arrested last night for suspected DUI. 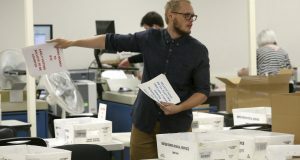 Arizona Republicans and Democrats agreed Friday to give rural voters an extra chance to fix problems with their ballots in the count of the state's tight Senate race, resolving a GOP lawsuit that sought to stop urban voters from using those very same procedures. Carolyn Warner, a longtime Arizona superintendent of public instruction and unsuccessful candidate for higher offices, has died. She was 88. Supporters of a ban on "dark money'' in political races are making a last-ditch effort to put the issue to voters in November. The president's choice for a new Supreme Court justice Monday means the ability of Arizona women to terminate a pregnancy likely depends on who is elected governor in November. Without comment, Gov. Doug Ducey signed legislation authorizing autonomous delivery robots to use sidewalks.